In the Mahabharata, it's mentioned that Arjuna forgot the Bhagavad Gita which was once heard in the war field from Lord Krishna. Bhagavad Gita is one of the greatest messages or advices from Lord Krishna to the whole world and it was advised to Arjuna to do his Karma. But after the Mahabharata war, one day Arjuna told that he had forgotten the Bhagavad Gita. Why did this happen? How can a man forget the greatest advice which led to the success of his life? Was there a mistake in the way Arjuna grasped the Gita that led to this incident? O mighty-armed one, Your greatness became known to me upon the approach of the battle. O son of Devaki, Your form also, as the Lord of the universe, then became known to me! What You said unto me at that time through affection, O Kesava, has all been forgotten by me, O chief of men, in consequence of the fickleness of my mind. Then Shri Krishna friendly rebukes him for being such a dull witted and faithless person (अश्रद्दधानॊ ऽसि दुर्मेधाश चासि पाण्डव [MB - 14.16.10]) and narrates to him another set of instructions known as the Anugita. I think (am not absolutely sure) I read somewhere that after Lord Krishna showed Arjun the ViswaRoop (the Grand Divine Reality that everything is God and that God is everything), he felt that it would be difficult for Arjun to lead a life of normal human being with this realization. Arjun would no longer be able to accept Krishna as his friend and soul mate; instead he might look upon him only with respect and awe. Hence, he told Arjun that he would make him forget everything that was shown to him during the Gita episode. The Gita instructions would only leave a subtle impression in Arjun's sub-conscious mind. Why did Arjuna forgot the Bhagvat Gita ? The exact reason is given in Shreemad Bhagvat Purana -Skanda 1- Chapter 15 - Shloka 30. It's said that Arjuna forgot Shree Krishna's teaching given to him at the time of Kuruksetra war because of Time factor and some of the mistakes happened from him while doing some works and his attachment to the pleasure. So forgetting this knowledge was outcome of the results of his own mistakes as well as time. The word "kāla-karma-tamo-ruddhaḿ " in the verse is clearly mentioning the reasons. This reason is also confirmed from Motilal Banarsidass version of Shreemad Bhagvatam. Swami Prabhupadas translation seems to be far different , he is saying that it was leela of Shree krishna and was result of his absence . But actually this verse is not saying anything about the pastimes of krishna or his absence but only stating that this is due to time factor and Arjuna's own actions. (Gita Press translation) - Due to the time and due to the mistakes happned because of various actions performed by arjuna , he forgot the knowledge of gita given to him by Shree Krishna at kurukshetra war. But due to bhakti towards Shree krishna he again remembered that. Same way as we forget the advice given to us by elders. 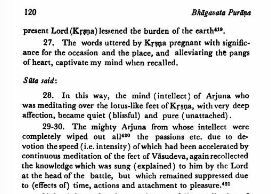 And here Krishna speaks of brahma jnana. Most difficult of all which gives us realization. Was Arjuna mentally prepared to understand all those which Krishna taught? Bhagavad Gita itself mentions that Arjuna could not hold a lot of teachings and hence asks for simpler ways. Example : We cannot learn medicine directly. First we must read lower classes and then mature gradually. Similarly to understand what Krishna taught, Arjuna did not had that maturity to undertsand and adopt. Arjuna wasn't enlightened, of the many characters of the Mahābhārata, only two were enlightened: Kṛṣṇa, and then Balarāma. The two of course represent divergent attitudes towards enlightenment-in-general. For Kṛṣṇa, even though he was “enlightened,” he involved himself in the politics, war, and romance of day-to-day life (this was, by his own admission, for the purpose of effecting justice throughout the world). For Balarāma, there was almost no such involvement. It's for this reason that Balarāma/Saṅkarṣaṇa is sometimes regarded as Śiva-like, whereas Kṛṣṇa is regarded as Viṣṇu-like. Arjuna was just a particular jiva who happened to be friends with a particularly-enlightened person (i.e. Kṛṣṇa). Unfortunately being friends with an enlightened person does not necessarily mean that you yourself will become enlightened. Enlightenment, if we are to talk about it, is more of a solo endeavor that requires great grit, determination, and bravery to actually bring about. So it's not really a random thing, consequently it is very rare (regardless of the time that you live in). Shockingly, it is thus found that only two characters in the great Epic are actually seen to be of significance (i.e. Vāsudeva and Saṅkarṣaṇa). It is for this reason that the Jainas probably choose to focus on Baladeva and Vāsudeva alone, to the exclusion of the other characters. The point is that enlightenment/salvation/belief is rare. Of the manifold characters of the Mahābhārata, Kṛṣṇa achieved this state, and perhaps Balarāma. Arjuna was just Kṛṣṇa's worldly friend. There is no doubt that Kṛṣṇa's and Arjuna's friendship was deep and affectionate, but their respective levels were not comparable, and so it is for this reason that Arjuna was able to learn a little bit (at least temporarily) through osmosis, especially via the philosophy that Kṛṣṇa preached right before the war, but ultimately, none of it stuck. Why did Arjuna forget teachings of Bhagavad Gita? Is the current form of Gita is authentic as what Krishna actually said or interpolated? Who has written Bhagvat Geeta?